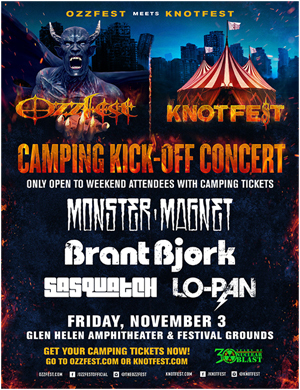 This year's OZZFEST MEETS KNOTFEST--Saturday, November 4 (OZZFEST) and Sunday, November 5 (KNOTFEST) at Glen Helen Amphitheater And Festival Grounds in San Bernardino, CA--will once again kick off with a special campers only pre-event concert. The exclusive free Friday, November 3 camping kick-off concert will give campers early access to the campsite, allowing them time to prepare for a night of performances from MONSTER MAGNET, BRANT BJORK, SASQUATCH, and LO-PAN. VIP camping lines open at 4:00 PM, general camping load in begins at 5:00 PM. Doors to the Friday night camping kick-off party open at 7:00 PM with live music set to kick off at 8:00 PM. In addition, beginning Tuesday, August 1 at 10:00 AM (PT) a $99 all in bundle two ticket, two day ticket price is available through Saturday, August 5 at 12:59 PM (PT) for the multi-stage, two-day weekend camping event that will include more than 40 acts.